Cornwall Ontario – Tickets are going quick for the 20th annual CJHL Prospects Game scheduled for January 25, 2017 at the Cornwall Civic Complex. As it stands currently, 800 tickets have already been sold and organizers expect that number to rise as the game approaches. 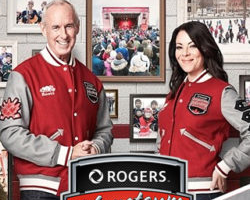 “This national event draws hockey fans from all across Canada to witness the top 40 Junior “A” players in the country,” said David Murphy, event Co-Chair. Following the recent success of the World Junior Championship exhibition game at the Civic Complex, Cornwall continues to be recognized on the national radar for major hockey events. In addition to drawing hockey fans from far and wide, dozens of NHL scouts will be attendance, including those from the Ottawa Senators, Montréal Canadians, and Toronto Maple Leafs. The event is not only drawing scouts to Cornwall, but hockey fans as well. Organizers have been fielding enquiries from family members and fans from western Canada and other parts of the country. 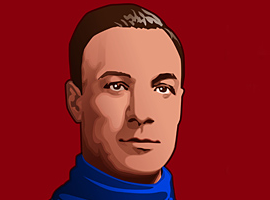 The rosters for the game were put together by NHL Central Scouting, headed up by its Director, Dan Marr. “The CJHL Prospects Game is a tremendous opportunity for these players to showcase their ability and represent their teams, leagues and communities on a national stage,” said Mr. Marr. 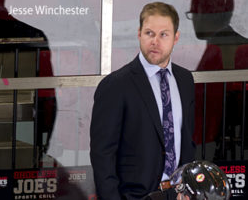 To add some local flavor to the game, formers NHLers and hometown products Chad Kilger and Jesse Winchester will serve as honourary coaches for the contest. With tickets set at an affordable price, hockey fans will have the opportunity to watch a game with a play-off style atmosphere to it as players compete to impress NHL scouts. Numerous players from last year’s Prospects Game ended up being drafted by NHL clubs. 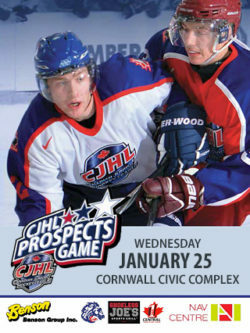 Tickets for the CJHL Prospects Game are now on sale and are available via the Civic Complex box office (main floor of the concourse). Tickets are $10 for adults and $5 for children 12 and under. The price drops to $9 per person for groups of 20 or more. The Canadian Junior Hockey League is a national organization comprised of all 10 Junior A hockey leagues in Canada. The CJHL represents 132 teams – including the Cornwall Colts – and more than 3,000 players. The CJHL is a proud partner of Hockey Canada and is the only approved Junior A league in Canada. 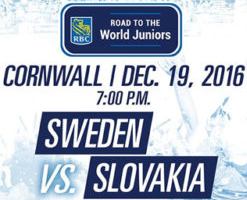 Each year CJHL players compete for the RBC Cup National Junior A Championship and represent Canada internationally at the World Junior A Challenge. Situated in scenic Lamoureux Park on the banks of the St. Lawrence River, the Cornwall Civic Complex is a highly versatile and modern facility. The heart of the Civic Complex is the Ed Lumley Arena, a modern ice rink that boasts seating for up to 5,800 people for concerts and special events. The Civic Complex has hosted a number of special events in recent years such as the RBC Cup National Junior A Hockey Championship and concerts by Hedley, Nickelback, Alice Cooper and Blue Rodeo.